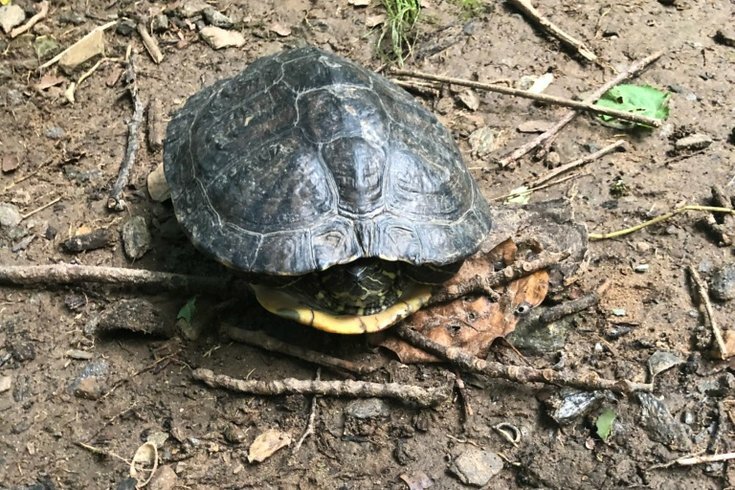 A third turtle went missing in Philadelphia in August 2018. In this case, the creature was released into the wild. Alright, this is getting out of hand. Earlier this month, we brought you two separate stories about pet turtles that went missing in Philadelphia only to be reunited with their concerned human families. Today, we bring you a third that has not reached the same happy conclusion, as of yet. Deborah Wilson was kind enough to share the details of an Aug. 10 discovery in the driveway of her home near Ardleigh Street and Wadsworth Avenue in the city's Mount Airy neighborhood. We’ll let Deborah take it from here. Sure, this is a common concern, but her husband Leroy – an aquarium hobbyist who has nurtured their family amphibian for more than a dozen years – was doing nothing of the sort. Leroy immediately put the reptile into a storage bucket with food, water and a piece of driftwood. That is nice. Though they’ve asked around in an attempt to reunite turtle and family, they have not yet found the owner. That is not nice. "He may have been a pet or was swept up in recent rain downpours," Deborah surmised. After searching for about a week, Deborah's husband and son released the creature into a creek near Valley Green Drive in Fairmount Park. "The funny thing is that this species predominantly spends most of the time in water, so he had to travel quite a distance to find our driveway," she said. And please, turtle owners of Philadelphia and beyond, start keeping a better eye on your pets. To help, we're linking a tipsheet from The Humane Society regarding the proper care of pet turtles, as this is not only a Philly-centric issue.